it never fails ... every time i read a victor davis hanson book, i feel smarter. more importantly, i learn something new almost every time i read one of his books. 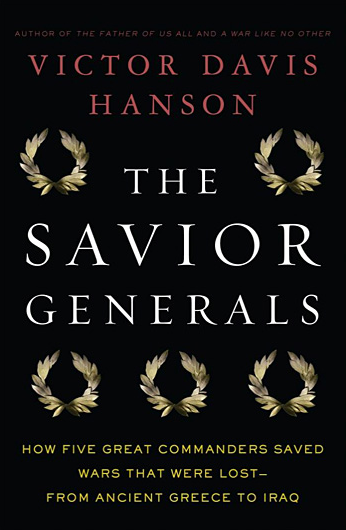 this book is about five generals who didn't start or end a war, but rather who saved wars from being lost. the five generals are themistocles, flavius belisarius, william tecumseh sherman, matthew ridgeway, and david patraeus. i read this book fairly quickly while on vacation this year and so therefore did not get a chance to really soak it in. now, i'm reading it a second time through to understand better why and how these savior generals were able to do what they did. i was going to do one big post, but have decided to consolidate my summary as i finished each chapter. vdh sets the scene by describing the persian hordes and xerxes running ram shod over the greeks. no persian army had ever extended so far into greece. the great spartan king leonidas (who everyone is familiar with because the story of the 300 is told and re-told) is dead. yes, that was a brave fight by the spartans at thermopylae, but now athens and the rest of greece were facing annihilation. in steps themistocles with a daring idea ... empty athens and place the entire fate of greece in the hands of the athenian navy to fight the persians instead of retreating to sicily. the navy parked in the straights of salamis and then essentially tricked the persians into fighting. once the persians engaged the greeks at salamis, it was all over. the smaller, more maneuverable ships smashed the lumbering persian navy to bits. xerxes and his hoardes were sent packing back to persia. xerxes left mardonius to try and 2nd and 3rd offensive. but mardonius was eventually "crushed" as well by the 70,000 greeks and thus greece was assured freedome from persia. many historians agree about the impact of the battle of salamis on the world's history - it allowed greece to continue to grow as a culture, directly impacting western civilization history. a number of things allowed for the victory at salamis. sure, the greeks had their backs up against the wall, but it really was the cunning, ego and drive of themistocles that allowed athens and sparta to win. first was themistocles background and heritage. this guy was a scrapper. he had no rich parents to dote on him. he fought and he used every means he could to get his way. let me list several words vdh used to describe themistocles: outsmarted the betterborn, intelligent, ruthless energy, studied and prepared for more diligently than did his advantaged rivals, mobile and serpentine mind, rascally busybody, clever, limitless troublemaking, multifacted leadership, diplomat, calm in battle, unabashed cunning, deceit, the most gifted strategist that classical antiquity ever produced, arrogant, absolute confidence in his own wisdom and leadership, schemed to ostracize his rivals, faked omens to frighted the more pious into his fold, unprincipled behavior, rogue, foresight. second, in light of the finding of silver in a mine, themistocles was able to convince the people to invest in a navy - to give the silver coins to the lower class and let them participate in the defending of their country. to offer another vdh quotes, "he somehow persuaded the assembly to build enough ships to ensure a fleet that would reach two hundred triremes. how a radically democratic politician could persuade his own constituents to pass up such easy money in the here and now in order to invest in an unproven navel program against a distant enemy, we are not told. but themistocles' navel law proved a monumental turning point for athens, not unlike, in the american experience, the passing of the selective training and service act of 1940 that squeaked by in the house of representatives in august 1940 by just one vote - and just in time, on the eve of war." 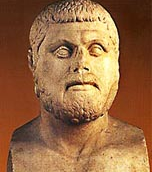 third, going back to the character of themistocles, he not only was able to get his navy, but then was able to convince the people not to flee to sicily, but to fight at salamis. once there, he was able to deceive the persians into pursuing the greeks at salamis and even without their entire force. he tricked xerxes into sending his best contingent forces to chase the greek retreat - which never came. themistocles was then ale to smash the persians to bits at salamis to their "utter and complete ruin." the aftermath of themistocles' life is a bit sad. the same attributes which helped him be a savior for his fellow greeks also contributed to his downfall. he was forgotten and eventually ended up in persia where he presumably was going to be forced into service of the persians to fight the greeks, but not before he committed suicide. vhd also goes on to demonstrate that athens fully embraced themitocles vision of an athenian navy, even though they would not admit it was because of themistocles. 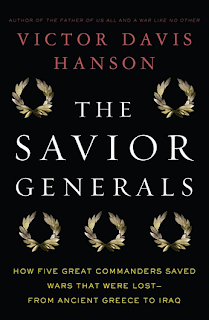 i'll conclude with the vdh conclusion, "quite simply, without the savior general themistocles, the world as we know it today might have been a very different place indeed. victory at marathon in 490 had alarmed themistocles while most other rejoiced. defeat at thermopylae had encouraged him when most greeks fell into abject despair. before salvation at salamis there was no free greece. after themistocles' victory, there were soon to be few foreign enemies in the aegean. his dream of an ascendant athenian maritime was assured - and yet along with it a deadly rivalry with sparta on the horizon."